Juvenile justice, Administration of; United States. 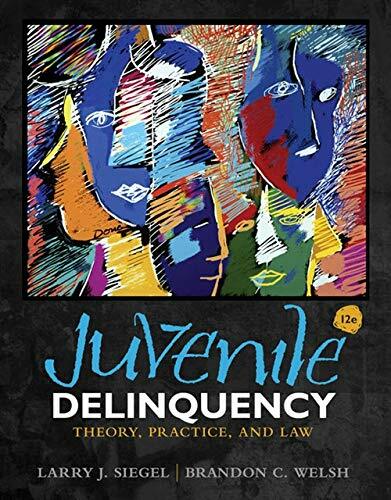 Amazon.com description: Product Description: Unrivaled in its current coverage of topics, the twelfth edition of best-selling JUVENILE DELINQUENCY: THEORY, PRACTICE, AND LAW provides you with timely coverage of theory, policy, and the latest research. Praised for its balanced approach and for the authors' engaging writing style, this book will help you understand the nature of delinquency and its causes, as well as current strategies being used to control or eliminate its occurrence. About: Unrivaled in its current coverage of topics, the twelfth edition of best-selling JUVENILE DELINQUENCY: THEORY, PRACTICE, AND LAW provides you with timely coverage of theory, policy, and the latest research. About: Unrivaled in its current coverage of topics, the best-selling JUVENILE DELINQUENCY: THEORY, PRACTICE, AND LAW, Eleventh Edition, provides you with timely coverage of theory, policy, and the latest research. About: This best-selling JUVENILE DELINQUENCY: THEORY, PRACTICE, AND LAW, Tenth Edition, text gives you timely coverage of theory, policy, and the latest research. With Larry J. Siegel, Joseph J. Senna | 8 edition from Academic Internet Pub Inc (December 31, 2006); titled "Cram101 Textbook Outlines to Accompany Juvenile Delinquency: Theory, Practice, and Law"